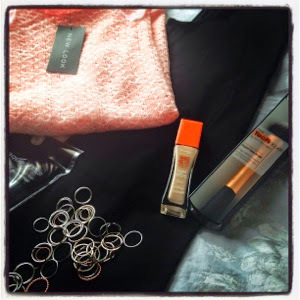 Starting with the clothes, I bought this gorgeous coral/pinky jumper from New Look! It's really soft and super light so it'll go nicely if I just want to throw it over the top of something. Plus it adds a little bit of colour to my wardrobe. Plain black jersey dress from H&M's Basic range. Now the thing I love about their basic range is that they are simply basic! Cheap price, easy to wear, can dress it up or dress it down. Tights from Dorothy Perkins - always get mine from there 80 denier pretty standard, they do the job well. Loads of thin little rings that I can play around with, these are from H&M as well. I'll be honest I never really buy costume jewellery so thought they were a little pricey for what they actually are but hey, why not give them ago. Rimmel Wake Me Up foundation, I bought this after reading another blog who reviewed the product. I've bought the Light Porcelain shade because I have a very fair completion and I've been feeling rather dissatisfied with my other liquid foundation because it was slightly more orange than I like. A new make up brush (another I hear you question...yes another) a Real Teachniques brush. This one is a little closer to a stippling brush which should blend the foundation a little better on my face. Immediately I love the density of the brush so I have high hopes for this beauty! What treats have you bought this weekend? !